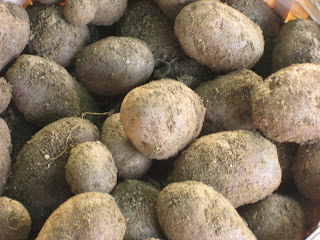 Dave and Lisa's Backyard: Potato Blight! ARGHHH! 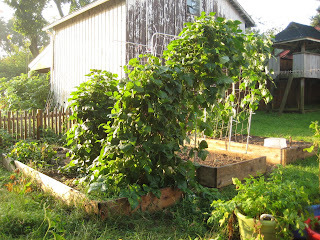 Actually, the potatoes were A-OK, but the tomatoes were a mess so we pulled them all up, and harvested the last of the potatoes as well just to be sure The garden looks quite naked, and WOW are the beans big! So, I planted too much, they are such tiny little things when you put them in the ground and they look so lonely so you give them friends which is OK but you must cull them! So cruel! 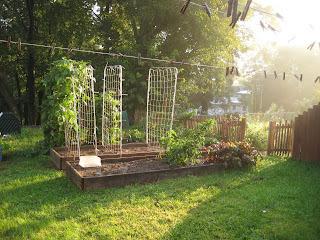 The tomato trellises look like matress springs don't they? They are made of conduit pipe and nylon netting, then a piece of rebar into the ground and slid the two trellis ends over top, clever huh? 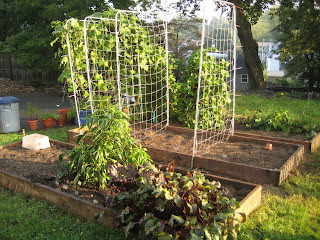 stole it from "Square Foot Gardening"!